Bringing up Bella: Wordless Wednesday 34 - Smile! That's one of the biggest smiles I've ever seen!! Who's that dashing young dog on the picture?!? By the way, great great great profile pic. Love the full frontal. that smile made me smile!! Hey What a great smile buddy? What a lovely smile, makes me happy just looking at the photo! What a great big smile!!! Isn't it awesome? I realized after I clicked 'publish' that I blew the perfect opportunity to use "When You're Smiling" for a title - don't you think this guy would sound just like Louie Armstrong? Hi Carol, thanks for dropping in. You know, Haopee, I'm embarrassed to admit, I forgot this handsome fella's name. There were a lot of dogs who visited the old farm field where we used to hang out and, I knew a lot of their names but didn't catch this guys. Hi Oskar, thanks for dropping by. Boxers all seem to have the best smiles, don't they? Welcome back, Finn! Hope you're smiling, too, after you're little vacation. Hard not to smile at a happy dog, isn't it? He was just a gusher of happiness - lovely to be around. I know there's some dispute as to whether or not dogs actually smile but geez, it certainly looks like this one does, doesn't it? Right - who can resist that smile? 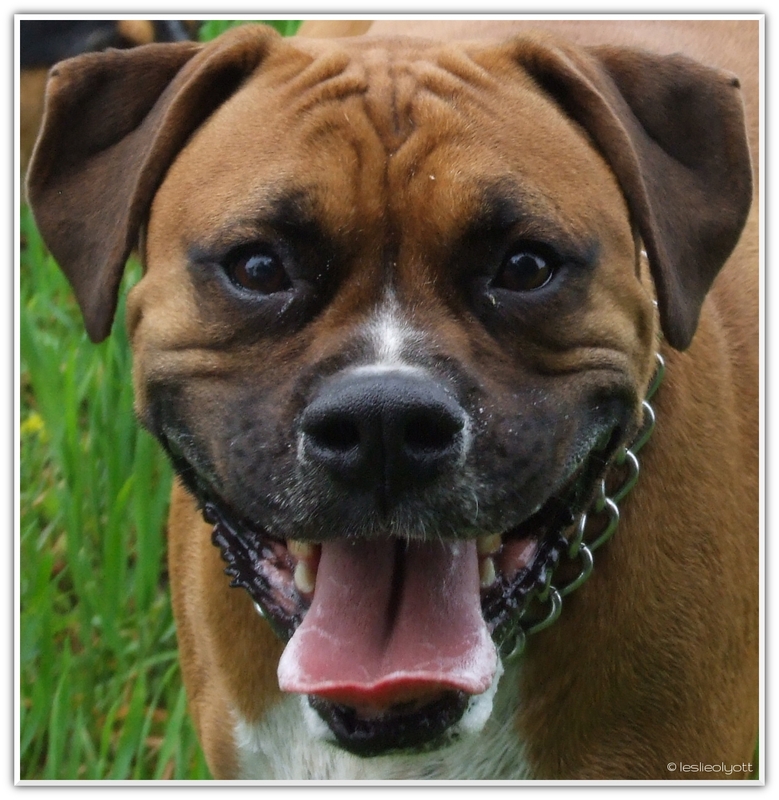 Boxers and Bullies have particularly bright, big smiles, don't they? That would have been amazing! He is so Louie. What a beautiful pup and what an awesome smile! Oooooh what a fantastic smile!